Here is a list of Best Free Computer Shutdown Timer Software for Windows. These software let you schedule shutdown on your PC pretty easily. Apart from automatic shutdown, some of these software can be used for various other actions, like: logoff, restart, hibernate, lock computer, lock monitor, run screen saver, run file or program, stop program or services, open web page, etc. Some shutdown timer let you set exact date and time to shutdown, some let you set a countdown timer, while some can do both. Most of these software are pretty simple and easy to use. Some of these shutdown scheduler have advanced options, like: password protection, repeat mode, schedule shutdown based on CPU load, data usage, etc. The list of these PC shutdown timer has been compiled very carefully and steps on how to schedule shutdown has also been explained for almost all of these turn off timer software. I like Windows Task Scheduler the most. It not only lets you set time as trigger to shutdown PC, but also other factors. Shutdowns can also be scheduled daily, weekly, and monthly. It not only schedules shutdown but various other tasks and programs. You can also checkout the list of best free Task Scheduler Software, Folder Sync Software, and DLL Fixer Software. You can use Window’s Task Scheduler program to schedule shutdown for your computer. To set a turn off timer through it, go to Start menu, type Task Scheduler and open the program. Click on Create Basic Task, which is available on the right panel. Enter task name and description. Set Trigger: Set time for the task as daily, weekly, monthly, one time, when computer starts, or when I log on. Set Action: Options to Start a program, Send a Email, Display a message, or Add program script/exe file are available. Choose the Start a Program option, then click Next. In the arguments field, type /s, then click Next. Review the shutdown timer parameters, then click on Finish to activate timer. Your computer will shutdown automatically at the set time. Run utility can be put to use if you want to set a timed shutdown on your computer. Press Windows Key + R to open the Run tool. You can also find and open Run tool by typing Run in the Start menu. Once the Run window is open, type the shutdown command. Say, I want to set a shutdown timer for 30 minutes (1800 seconds), so I will type the following command: shutdown -s -t 1800 and press Ok. The computer will shutdown exactly after 30 minutes/1800 seconds. Here the -s is the command for Shutdown. Use -l to Log off and -r to Reboot. The time must be entered in seconds. Command Prompt is preferred by some folks when it comes to performing a task. You can utilize CMD fot timed shutdown of your computer. Open Run window (Start Button + R), type CMD and click Ok.
Command Prompt opens. Type the shutdown command followed by the time to shutdown in seconds. Press Enter to activate the timer. A conformation pop up displays the scheduled task to automatically shutdown computer. Windows PowerShell is a task automation tool which works with command lines and scripts. It works the same way as CMD to set shutdown timer. Type shutdown –s –t 1200 in PowerShell to set a 20 minutes shutdown timer. If you want to set a different time, multiply the minutes with 60 and add after the code instead of 1200, then press Enter. The timer will be set. Shutdown8 is a free and simple shutdown time for Windows. It has a small interface with few options to set timer for Shutdown, Logoff, Restart, Hibernate, and Sleep. You can select any of these options, and then set Timer. The timer has pre-set values; you can select any of them or simply add value to timer, manually. You can cancel the timer anytime. Turn Off Timer lets you set schedule shutdown by manually setting turn off timer. The small interface lets you enter Hours, Minutes, and Seconds, then choose if you want to Shutdown or Restart. You can also select if you want a Forced Shutdown. Once you have set the timing, click on Start to begin the timer for computer shutdown. You can also pause and resume the timer if you want. Sleep Timer is a bit advanced shutdown timer to schedule shutdown. It lets you set timer in 3 modes: Countdown, Inactivity, and Time. Countdown option counts to a given time and performs the action defined. Inactivity option performs action after defined value of inactivity time. Time option performs action at a given time value. Action can be defined from the following options: Shutdown, Restart, and Hibernate. Set the timer, then click on Play button to begin the timer. A direct Shutdown switch is also available. Windows Shutdown Assistant lets you add Actions to automatic shutdown computer. Apart from shutdown, you can also perform various other actions based on timer, like: logoff, restart, hibernate, lock computer, lock monitor, run screen saver, run file or program, stop program or services, open web page, and open message. You can set up an Action in 2 steps. Step 1 is Trigger, while Step 2 is Action. Step 1: Select any of the following trigger types: In “x” minutes, At a date and time, Repeat task every “x” minutes, System ideal for “x” minutes, and CPU usage stays “x%” for “y” minutes. Step 2: Select the Shutdown action. You can also choose any of the above mentioned actions. You can add additional countdown before action is performed in “x” seconds. Click on Add to Action List once the values are set. You can add a note to an action if you like. Finally, click on Start to begin the timed shutdown. SLAWDOG Smart Automation is a free timer based software to trigger actions. The list of actions includes option to shutdown computer. First you get to select the trigger type and then the action. Select any of the following triggers: One time, Daily, Weekly, Monthly, Every x minutes, etc. Other actions apart from shutdown which can be selected are: Reminder message, Logoff, Restart, Hibernate, Sleep, Lock, Start/Stop program, etc. A job is added to work-space, which can be later modified or deleted. Alarm Clock is a simple alarm clock software for Windows, which can be utilized as PC shutdown timer. The interface lets you set a time for alarm, choose days from week to set off alarm, select an alarm sound, add a reminder message, and at last you can choose to Shut Down computer at the set alarm time. Alarm tone and text reminder options will not be applicable if the automatic Shutdown option is selected. Shutdown Timer lets you set timer to shutdown computer as tasks. Set a schedule then set time for it. In Schedule option, you can choose to Shutdown, Restart, or Logoff. You can choose any time from 1 minute to 120 minutes. There is also an option to Switch Off Monitor Now. Click Ok to begin the timer; interface is minimized to system tray. Simple Shutdown Timer, as the name suggests, lets you set turn off timer pretty easily. Add a time to perform the operation in Hours, Minutes, and Seconds, then select the Shutdown option from the dropdown list. Other options included in the list are: Logoff, reboot, hibernate, and sleep. Click on Start to begin the automatic computer shutdown timer. 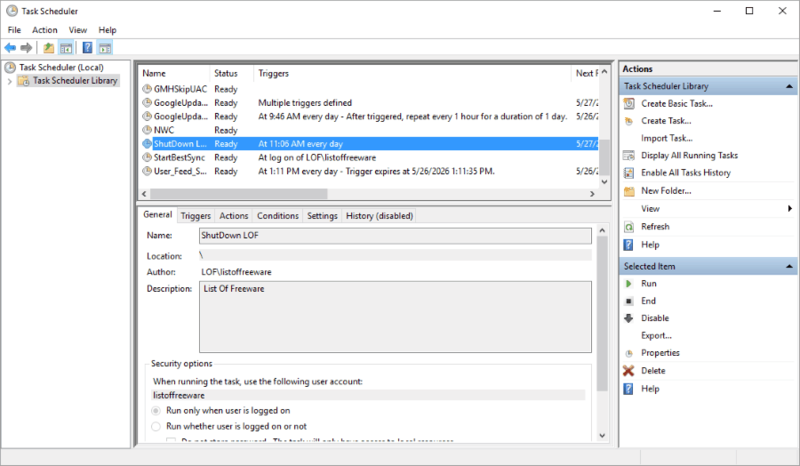 Timed Shutdown is another free software for timed shutdown. This freeware lets you set various triggers based on countdown, time, CPU usage, and if disconnected from internet. To set time based trigger, click on Time, then set time, and select the Shutdown option from the When Triggered drop-down. You can also choose to restart, logoff, hibernate, or disconnect. There are also options to force shutdown and do a final countdown. The countdown timer can be set from 0 to 30 seconds. TimeComX Basic lets you trigger various actions based on time, day, date, or computer activity. The UI is divided into two sections: Event and Task. Under Event you can select a trigger type for shutdown. It can be set by a simple time counter, advanced time counter, daytime (set time, date, or days for trigger), and activity monitor (checks CPU, memory, disk, and network activity for a set value). Under Task section, choose the Shutdown option. Other options available there are: sleep, hibernate, and restart. A countdown warning can also be set before shutdown for 30 seconds. Click on Start to begin the shutdown timer. It can be stopped whenever you want. Shutdown Timer‘s easy interface lets you set countdown time in minutes and seconds. Option to set a date for shutdown is also provided. Select Shutdown as action or you can select other activity, like: Restart, standby, hibernate, logoff, logoff(force), or lock computer. Click Activate to begin timed shutdown process. WinMend Auto Shutdown is another good automatic computer shutdown software. Here you can set shutdown task along with timer. You can also choose to logoff, sleep, or hibernate if required. Set daily trigger, one time trigger, or a countdown timer. Click on Start Task to schedule shutdown. Monitor Power Saver is primarily a monitor power saver software, which also offers option to set shutdown computer timer. To set shutdown timer, go to the Advanced tab on the interface, set the time, select days if required, then select Shutdown as Action. Choose the Start option, then click on OK to schedule shutdown. This freeware lets you save power by turning off monitor after a defined time of inactivity. Shut IT lets you either begin a countdown timer or set a specific time to shutdown computer. Choose any of the radio buttons: Countdown or Specific Time. Now click on Shutdown to start timer or to schedule shutdown. Other actions which can be scheduled are: Reboot, logoff, standby, or hibernate. Shutdown PC is a really simple computer shutdown software. It not only lets you set countdown timer as a trigger to shutdown PC, but you can set other parameters as well. These include: When PC ideal for a specified time period, at a specific time, when a particular application shuts, and when a particular application stops playing sound. Set any of the options, and click on Begin to schedule shutdown. Hyper Shutdown lets you schedule shutdown just like any other shutdown timer. Select the shutdown action or you can select any other action as per your requirement. These actions include: restart, logoff, hibernate, hibernate & wake, standby, lock computer, and reminder. After selecting action, you can select a trigger mode. Choose to set a countdown timer, select a specific date, or a time. Click on activate to begin the timed shutdown process. There are also options for forced shutdown, execute a file before action, and to set warning time. RTG Ninja Shutdown is a very simple shutdown manager for Windows. It displays the current system time and you just have to set a time when you want to shutdown your computer. Click on SET once you have entered the time to schedule shutdown. There’s an option to set the timer to the last shutdown time. AutoShutdown Scheduler has options to schedule a shutdown or set a countdown to do so. Select Shutdown as action or you can choose Restart and Hibernate as well. The scheduler tab lets you add a specific time to schedule shutdown. It can be set as a daily schedule, or simply set for a specific date. The countdown tab has only fields to add hours, minutes, and seconds. Set schedule to begin timer. Remove scheduler option is also available. Shut up! Timer lets you set countdown timer to shutdown computer pretty easily. You just have to set timer in Hours, minutes, and seconds. Select Shutdown action from the drop-down, then click on Run to activate clock. You can also choose to select: shutdown (force), logoff, or restart as actions. Shutdown After a given duration. Shutdown At a given time on a specified date. Shutdown At a given time, everyday. Shutdown When a process stops running or starts running. Shutdown When there is no mouse or keyboard input for a given duration. Shutdown When average CPU usage is below a percentage for given duration. Shutdown When on a average, hard disk is not busy for given duration. After defining the trigger, click on Add Schedule to activate automatic computer shutdown. Puran Utilities offers a good set of useful tools apart from Shutdown timer. These include: Disk check, uninstaller, startup manager, service manager, disk cleaner, delete empty folder, fix shortcuts, registry cleaner, registry defrag, puran defrag,duplicate file finder, data recovery, file recovery, disk files, permanent delete, wipe disk, splitter, delete history, batch fix, and maintenance wizard. Shutter is a shutdown scheduler software, which is free for personal use. It lets you add shutdown task in 2 steps. First you have to add an Event, that is the countdown timer. Then you have to add an action as Shutdown. You can also add other actions and events. Click on Stop to cancel the timer. Click on Now to immediately Shutdown computer, or to immediately take other action, which is defined. Vista Shutdown Timer lets you set timer to shutdown PC automatically. You can either set a countdown timer or simply set a time. Select the Shutdown option or you can choose to Log off, hibernate, standby, or restart. Click on Run Timer once the parameters are set. AMP WinOFF is a bit advanced tool for timed shutdown of Windows. To schedule shutdown, go to the Shutdown Planning tab to enable a trigger type. It can be a specific time on a day, intervals, based on user activity, or based on CPU load. You can also choose the Shutdown type: Power off, close session, sleep, lock session, restart, hibernate, adm.shutdown, or adm. restart. Enable Force shutdown if required. Options to set administrative password is also available. DShutdown lets you shut down not only your computer, but various other operations on your computer. Select Shutdown from the Shutdown Type section. Other options that you can choose from that section are: logoff, power off, reboot, standby, hibernate, force if hang, lock workstation, walk up, screenshot, start alarm, write log file, close a program, alarm clock, etc. Go to the Timer section to set countdown timer or to set a particular time to shutdown PC. You can also trigger shutdown based on network usage and CPU usage. The most important feature of this freeware is that it also lets you schedule shutdown on multiple PCs if connected on the same network. All you need to do is search for computers, select one, and enter password to apply changes to it. Shutdown PC lets you set PC shutdown timer through an appealing interface. Set action as Shutdown, then select a shutdown trigger type. For shutdown timer, you will have to set a countdown timer. Wait for download speed to reach x KB/s. Wait for upload speed to reach x KB/s. Wait until CPU usages reach x %. Wait until disk write speed = x KB/s. Wait until disk read speed = x KB/s. Wait until PC idle time = x mins. ShutMeDown lets you Lock, logoff, sleep, restart, hibernate, hybrid shutdown, and shutdown computer automatically by setting a countdown timer. You can also schedule any of the above mentioned actions weekly for a given time. A security password can also be added. After setting time and other parameters, click on Start to begin Shutdown timer. There is also an option to display notification 30 seconds prior to execution of a scheduled action. You can schedule multiple actions, and all can be viewed at a time. Daxtar’s Shutdown Timer is an open source shutdown timer software. To schedule a shutdown, click on the dropdown on top of the UI to select Shutdown. Reboot and Logoff options are also available. Either set a timer, or set a time to perform the selected action. Click on Enable Timer to start the program. This is a Java based software to schedule shutdown, known as Shutdown Timer. Set a timer upto a time limit of 24 hours. You get options to schedule either a shutdown or a restart. Click on Start button to set these parameters. A 10 second warning is displayed before shutdown. You can also choose to play beep sound during last seconds. Shutdown Timer has predefined timer buttons to set countdown for shutdown. The time options that you can choose are: 10 minutes, 30 minutes, an hour, 2 hours, 3 hours, 4 hours… upto 10 hours. Simply click any of the button to set the timer. There’s an option available to Cancel All Tasks. Shutdown Timer is a very simple shutdown scheduler freeware. All you have to enter on the interface is a particular time to shutdown and the date when you want to. Click on Start to begin the timer. JShutdown Timer is another Java based shutdown timer for Windows. Here you simply have to add time in minutes when you want your PC to shutdown automatically. The interface displays the current time and the time when your PC will shutdown. Advanced Shutdown Timer is an open source turn off timer for Windows. Simply set the timer in Hours, minutes, and seconds. Set mode as Shutdown or you you can choose to hibernate, logoff, and restart as well. There is an option to force close running operations at the shutdown. You also get options to instantly shutdown or restart. E3MC Windows Shutdown Timer lets you set countdown timer or set a specific time to shutdown PC automatically. You can also choose to logoff, restart, standby, and hibernate if required. Force shutdown option is available as well. Minimize the software to tray once the alarm is set. Hsiu-Ming’s Timer lets you set time on a countdown timer and select from the following actions to perform: Turn off monitor, Shutdown, Reboot, Play Sound, and Run Program. Set the timer, select Shutdown as option, and click on Start to begin the timer. There’s an option to Run shutdown timer repeatedly. Shutdown Timer lets you shutdown and restart PC by setting timer. Set the countdown timer in minutes and minimize the application to system tray. You can select the option to force shutdown, in case any application freezes. The countdown is displayed on the UI. Smart Timer is another simple timed shutdown software. You can either set a countdown timer or set a defined date and time to schedule shutdown. Now, under the Actions section, you can either choose a program to execute or set the computer to shutdown, restart, logoff, and hibernate. Click on Activate to begin the timer. Pi Auto Shutter lets you set countdown timer to shutdown computer pretty easily. Set time in hours, minutes, and seconds. Then, click on the shutdown button available below along with restart, logoff, standby, lock, and abort buttons. There’s also an option to reset the timer counter. DeneDown has a very intuitive interface for you to set timer and view the timer status. Use the slider bar to set the timer anywhere from a minute to 24 hours. Set action as Sleep, Hibernate, Shutdown, or Restart. The remaining time is displayed through a bar. Use TimeOut to set countdown timer to shutdown computer. Set the timer in hours, minutes, and seconds, then select an action to perform, that is Shutdown. You can also choose from the following: show reminder, standby, suspend, reboot, and logout. Choose to save the current setting if you like. Click on Start to begin the timer. TICONT is another good computer shutdown timer. You can schedule shutdown, restart, hibernate, and sleep easily with this freeware. Simply set a timer to shutdown PC or you can also choose to shutdown instantly. Options to start and stop are available. It also displays current system time. MyShutdownTimer is one of the simplest shutdown scheduler software. You just have to enter the time in days, hours, minutes and seconds to begin the countdown. You can select from shutdown and sleep options. Start the timer once you have set the time. Zoom4Develop TM Shutdown Timer provides automatic shutdown options in a user friendly interface. Enter the time in minutes, select the shutdown action, then enable the timer. Other actions available are: sleep, lock workstation, logoff, hibernate, and restart. SleepTimer 2.0 lets you choose a time period to shutdown computer. You can select time in minutes, then choose from the following options: Shutdown, Restart, Sleep, and Hibernate. After setting the parameters, click on Start to begin the scheduler. Movie Sleep Timer lets you set timer if you happen to sleep while watching a movie. You can either set a timer or set VLC player as trigger. Set timer in hours, minutes, and seconds. The VLC triggers action when the player stops. You can either choose to Shutdown computer or Turn off screen. Snaked Shutdown Control lets you set timed functions as: Restart and Shutdown. To add a timer for the function, click on Customize. Add timeout in hours, minutes, and seconds. Click on Shutdown or Restart option after setting time to enable the timer. Cancel the timer if you want. GoTimer lets you set weekly schedule to perform various actions. These actions include: Lock, sleep, hibernate, logoff, shutdown, and restart. Set a time, select days of week for which you want to schedule shutdown, and select the shutdown option. A warning is displayed before the computer restarts or shuts down. All you need to schedule shutdown with ShutDowner is, set countdown timer in hours, minutes, and seconds. Click on Set and Exit and your shutdown scheduler will be activated. Another option available is to Cancel Shutdown. PC Utility is a freeware to schedule activity as Auto Tasks. It lets you Shutdown, Logoff, or Restart instantly and automatically by scheduling tasks. Click on Auto Task button to set timer and shutdown task, then click on Apply to begin the timer. koShutdown has a set of predefined shutdown timer counters. Timer can be set for 15, 30, 45, 60, or 90 minutes. You can also set a countdown after the timer goes off. The countdown can range from 1, 5, 10, 30, and 60 seconds. You can choose to cancel the timer or shutdown the PC instantly. Quick AutoShutdown is another minimal software to turn off computer automatically. All you have to do is select from a list of timers, which ranges from 10 minutes to 3 hours. All the timer options have 10 minutes gap between them. Simply select a time duration to start the timer. Another button available on the interface is to Stop the timer. Mz Shutdown Scheduler lets you schedule shutdown, restart, hibernate, and logoff. Apart from setting countdown shutdown timer, you can also use this freeware to trigger shutdown when a program closes, CPU usages is low than a given value, free RAM is lower than a given value, and at a specific date/time. Other shutdown options let you: wait before shutdown, play sound before shutdown, force shutdown, run program before shutdown, and display message before shutdown. A warning is displayed before shutdown. Chameleon Shutdown, like most of the timed shutdown software, lets you schedule shutdown, restart, sleep, hibernate, lock, and logoff. Choose to shutdown instantly or time it. You can set a timed delay, specific time, CPU usage, or closure of a program to trigger an action. After setting parameters, click on Start to begin timer. PC Sleep is another simple computer shutdown timer. Choose the shutdown function, then select any of the two trigger modes. You can either choose to Shutdown at or Shutdown in a specified time. Choose to restart, hibernate, logoff, or standby as per your requirement. Click on Start to begin the timer. MouseExtender lets you access control panel and schedule restart and shutdown easily. On the interface, click on Power button to access the shutdown timer menu. You can either select to shutdown, hibernate, or sleep. Time slider is available to adjust the timer. After setting timer, click on Add to begin countdown. Other options let you choose Force Shutdown option and Stop timer option. Shutti Shutdown Timer is another turn off timer which lets you set a shutdown schedule in two ways. Choose to Shutdown at a time or Shutdown in a defined time period. Else than Shutdown, you can choose to logoff, power off, reboot, suspend, hibernate, moniter off, or lock workstation. Select an action, set timer, and press Ok to schedule shutdown. PowerOff has options to schedule shutdown for remote computers on the same network. Choose shutdown as option, or you can select any of the following as per your requirement: log off reboot, standby, hibernate, lock walk-on-LAN, turn off monitor, or turn on monitor. and allow remote control. Click on Do It after setting parameters to begin the shutdown timer. Time To ShutDown displays the current time along with a dropdown list of timer options. You can choose: Now, 30 min, 1hr, 1.5hr, 2hr, 2.5hr, 3hr, 3.5hr, and 4hrs to schedule shutdown timer. Click on Enable to begin the timer. SHUTdown at sets timer for your PC to shutdown at a specific time everyday. Set a time, and this freeware will shutdown PC everyday at the same time. The interface displays the current time and the time remaining for shutdown. Shutdown Command lets you shutdown your own computer and computers on the same network. You just have to add IP address of the other computers. Choose Shutdown, restart, or log off as option. As other freeware, you can either select to Shutdown at a time or in a given time. Display notification warning and shutdown comment options are also available. After parameters are set, click on Shutdown to begin timer. WinShutDown is a simple shutdown timer software with the default time set to 10 seconds. Click on Start to begin the timer. No other time options are available. Click cancel to cancel the timer. AutoShut lets you set or schedule Events to execute on a given day and time. Maximize the interface from the system tray. Go to the Scheduler option in the menu to open a new pop up. Select all or any day from the days of week, enter a time, then select the shutdown action from the list of actions. The list of action includes: shutdown, logoff, restart, hibernate, suspend, and alarm. Click on + icon to set the scheduled shutdown. An event can be canceled, modified, or deleted. AutoShutdown shutdown scheduler lets you set time to shutdown at or shutdown after defined time. You can view countdown timer, which displays time left for shutdown. Click on Start to begin timer. You can also select to turn off monitor or hide the software. shutDownAgent is a bit advanced shutdown scheduler with options to wait for processes to end. Set a shutdown schedule with time and date, then select the Shutdown mode, and select the process options. You can either choose to wait for process to end or not to wait. If you choose the option to wait, then you can select various processes for which you want to wait. Click on Start to begin the process. An option to Switch Off monitor is also available. SHUT DOWN PLANNER lets you enter duration to shutdown computer in minutes. Enter the value and click on Planned Shutdown to begin the timer. The UI displays the Time elapsed and the Time remaining. Cancel the schedule or you can choose to Shutdown immediately. Use Auto Sleep to schedule a shutdown on your PC. Select a Date and time or set a countdown timer to shutdown PC in given days, hours, minutes, and seconds. After setting time, click on OK to begin the Timer. On the bottom of the interface you can view the remaining number of days, hours, minutes, and seconds for the automatic shutdown. Shutdown Xpert lets you force shutdown or force reboot in a defined duration of time. Select any of the option, then enter the number of minutes for the countdown to shutdown PC automatically. Click on Ok to begin the process. The shutdown timer can also be cancelled. shutdowngui lets you set countdown or timer to shutdown PC. Click on Countdown to set timer in Hours, Minutes, and Seconds. Click on Timer to add a date and time to shutdown. There’s an option where you can choose to Wait for selected processes that are running on your system. Click on Apply to begin the process. ShutDown Clock lets you add various actions as tasks, where you can add shutdown timer to automatically shutdown PC. When you click on Add option, you are given option to select a specific time, counter, idle time, and battery percentage as triggers. The list of actions lets you choose from Shutdown, restart, logoff, lock, and hibernate. Select occurrence as Daily or Once. The task will be added to the list of tasks, where you can add multiple tasks. There’s an option to warn you 5 minutes before the execution of any operation. Snooze Shutdown lets you choose any of the following options as actions: logoff, reboot, shutDown, hibernate, and sleep. Choose shutdown, then enter the countdown time in hours and minutes, and click on Start to begin the timer. Remaining time is displayed at the bottom right corner of UI. Option to Cancel operation is also available. KTimer is another simple shutdown timer software. Go to Settings and choose Shutdown. You can also select from sleep, hibernate, and notify options. To set a time, go to Mode and enter time. The timer starts as you enter time. The interface displays countdown timer. Shutdown After not only lets you schedule shutdown, but Restart, Hibernate, Logoff, and Standby. Either you can choose to Shutdown After a given time or Shutdown At a given time. Select any of the options and enter time in hh:mm format. Choose to warn 30 seconds before the action. Click on SET button to begin the timer. When you start Okra, it starts a shutdown timer with default value of 25 minutes. You can access the menu to change various parameters. You can stop the timer, change color, and add When done action. Choose Shutdown action in the When Done menu. You can also choose the following: do nothing, play a sound, reset timer, restart timer, dispaly message, hibernate, standby, logoff, and restart. You can also set from the following set of preset values of timers: 10 sec, 5min, 25min, 50min, and 2hr. iShutdown Timer lets you choose between option to schedule Logoff, Restart, Standby, and Shutdown. Now set the countdown timer in hours and minutes. Click on Start to begin timer. The time left is displayed on the UI. ShutItDown RBS Portable lets you add multiple tasks to shutdown, restart, and logoff PC. Click on the + button to add shutdown task. You can set repeat option on daily and weekly basis as well. Add time and date, then schedule the task. All the scheduled activities are displayed on the interface. Shutdown Scheduler is a free Java based automatic PC shutdown solution. Set a countdown time in Hours, minutes, and seconds. Select an action from Shutdown, Logoff, Restart, and Hibernate. Click Schedule to schedule the shutdown and you can later choose to cancel the schedule as well. Shutdown Timer is a simple automatic computer shutdown software. Simply set the countdown timer in hours, minutes, and seconds. Set action as Shutdown or Restart, then click Start to begin the timer. The timer can be stopped as well. My Windows Alarm has a small and simple interface where you can add shutdown countdown for your PC. Add a countdown timer in hours and minutes. The timer starts as soon as you set the time. You can also choose to trigger countdown sound before shutdown. SD Timer lets you choose shutdown options to automatically shutdown computer: normal shutdown and force shutdown. Add a time to shutdown with date. You can also choose to schedule reboot and logoff. Click on Start button when parameters are set to begin the timer. Click Stop to cancel the timer. DownTimer lets you schedule shutdown along with various other actions, like: sleep, hibernate, logoff, restart, force shutdown, force sleep, and force logoff. To schedule a shutdown, go to Schedule tab, enable it to add a task, add shutdown task, add date and time, and add repetition options as once, daily, weekly, monthly, or yearly. You can easily add various other tasks if you want. A 30 second warning is displayed before execution of scheduled task. 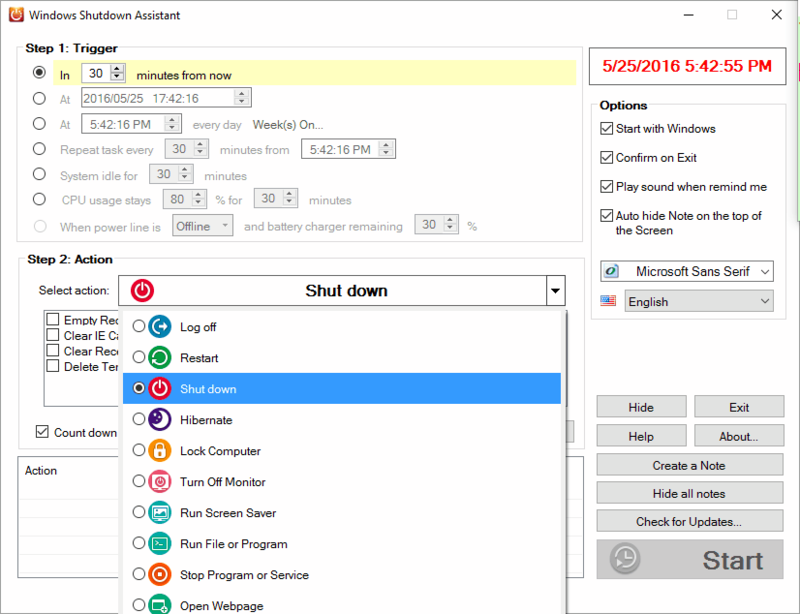 autoShut just has options to set shutdown schedule. Either you can set an Exact time to shutdown or start a shutdown countdown. After you have set the time, click on Start Countdown to begin the computer shutdown timer. ShutDown Wizard has 3 actions to execute, among which shutdown is an option. Other two options are to log off computer and reboot computer. You can either set a countdown timer or set a specific time to execute the chosen action. Force shutdown option is also available. Click Start to begin timer, click Stop to cancel the timer. 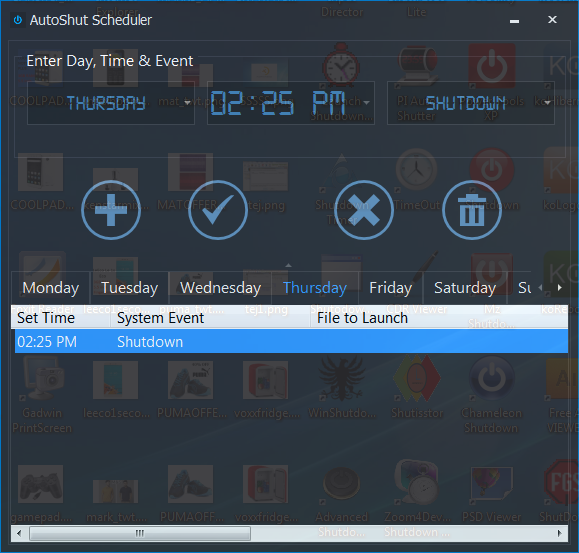 Auto Shutdown Plus is another good shutdown scheduler. You can schedule any of the given tasks along with shutdown: Restart computer, logoff current user, display message, force quit, and use alarm. Again, the timer can be either set for a specific time or you can begin a countdown. Current time and date are also displayed. After setting the scheduler, click on Activate to begin the timer. With HanExoft Timer you can either set an Alarm for a defined time, set a countdown timer, or begin a Stopwatch. As reminder you can choose to play media or show text. There’s a checkbox option at the bottom of the UI, where you can select to Shutdown computer when alarm goes off or when Countdown timer stops. Dabel Auto Timer lets you automatically shutdown computer and also provides options to schedule restart, logoff, standby, and hibernate. Set exact time to perform task in hh:mm format. Click on Set Time to schedule task. You can also add a note to be displayed. Current time is also displayed on UI. With Automatic Shutdown you can schedule either shutdown or logoff. Select either predefined countdown duration for 1 miute, 5 miutes, 10 miutes, 15 miutes, 30 miutes, 1 hour, 12 hours, or 24 hours or you can add custom countdown duration in hh:mm format. Start the timer to schedule shutdown or logoff. Shutdown has a slider to adjust shutdown timer from a minute to 23 hours. You can choose to set timer for shutdown, logoff , or reboot. Click Start to begin timer. Option to Abort timer is also available. Captain Shutdown lets you set password protected computer shutdown timer. Set the countdown timer in hours:minutes:seconds, then click Ok to begin timer. If you set a password, you will require that password to stop the scheduled shutdown. You can operate this freeware without password as well. Shutdown Timer lets you select a date and add time for a timed shutdown. Simply set a time and click Ok to begin the timer. You can reset the clock if you want. JP Timer has options to schedule shutdown, logoff, reboot, and to play music. Set countdown timer manually or choose from the dropdown list. Add music available on your computer if you want to play music when timer goes off. Stopwatch is also available. A 30 second warning is shown before scheduled shutdown takes place. Kill PC‘s simple interface lets you shutdown PC automatically by setting up shutdown timer. Enter time, select shutdown option, and Start the countdown. Time left is displayed on the UI. You can also schedule log off on your computer. Delayed Shutdown is another simple PC shutdown timer. Select the number of hours from 2 to 24 hours, then use the slider to set minutes. Click start to begin the timer. Timer can also be stopped. Relative Mode: Set countdown timer. Absolute Mode: Set a date and time to schedule. Repeated: Add daily or weekly shutdown timer. You can choose to repeat every x days. Select shutdown as task from the list of tasks: Shutdown, restart, logoff, alarm, monitor on/off, standby, hibernate, and cleanup task. Checkboxes lets you select following options: Force, Silent mode, Log deleted files, and Prevent stand by. After setting parameters, click on Start to begin the timer. Free Auto Shutdown is another simple automatic computer shutdown software. Select a task from list of tasks: Shutdown, restart, logoff, hibernate, power off, and sleep. Now select a specific time or set a countdown time to perform selected task. A daily schedule can also be set. A 5 minute reminder can also be displayed before task is executed. Windows Reboot lets you choose if you want to shutdown PC at a fixed date and time, after a countdown, or immediately. Choose shutdown from the list of following actions: lock computer, logoff, sleep, hibernate, reboot, shutdown, and power off. Start the timer to set the shutdown timer. Current time and action time are displayed at the bottom of UI. Simple Shutdown Scheduler lets you schedule multiple shutdowns and other tasks. You can schedule the following other tasks: restart, power off, lock computer, logoff, sleep, and start program. Set a defined time with date or set a countdown timer for the task. You can also choose to take immediate actions through this software.